The second Samuel B. Roberts ( DD-823) was laid down on 27 June 1945 by the Consolidated Steel Corp. Orange Texas; launched on 30 November 1945 sponsored by Mrs. Samuel B. Roberts and commissioned on 22 December 1946 Comdr. C. T. Doss in command. Following shakedown training off Guantanamo Bay in February 1947 Samuel B. Roberts joined the Atlantic Fleet. She participated in Atlantic Fleet maneuvers before proceeding to the Mediterranean in January 1948. Returning to the United States in June she began another year of operations along the east coast of the United States. She then conducted her second tour of foreign duty visiting northern Europe from May to September 1949. Roberts next participated in western Atlantic operations until March 1950 when she sailed back to the Mediterranean to join the 6th Fleet. She returned to the United States in October 1950. Following further operations in the western Atlantic and the Caribbean she got underway for Scotland on 10 September 1952 to join NATO forces in Operation "Mainbrace " before proceeding to the Mediterranean to join the 6th Fleet. 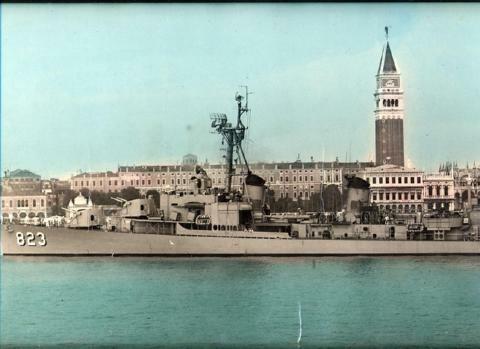 Two months later in November she returned for further duty off northern Europe and finally sailed for the United States arriving at Newport on 29 January 1953. Samuel B. Roberts operated in the Atlantic and Caribbean from early 1953 until 3 August 1954 when she headed for the western Pacific via the Panama Canal to begin an around-the world cruise. She spent five months in the waters around Japan and the Philippines then sailed across the Indian Ocean and through the Suez Canal arriving home on 14 March 1955. The remainder of 1955 was spent in local operations with the exception of a hastily ordered voyage in July to a lifeguard station off Greenland during President Eisenhower's flight to Geneva. Western Atlantic operations in early 1956 gave way to foreign duty when Roberts again joined the 6th Fleet in the Mediterranean on 27 September. On 25 October Roberts weighed anchor for the Persian Gulf and duty with the Middle East Force. She transited the Suez Canal on the night of 27 and 28 October the last warship to transit the canal southbound before it was closed during the invasion of Egypt. The ship was then on duty with the Middle East Force until sailing for home by way of Pakistan India East Africa the Cape of Good Hope and Brazil. Roberts arrived in Newport on 14 March 1957. With the exception of a midshipmen's cruise to Rio de Janeiro Samuel B. Roberts remained near Newport until mid-September. She then participated in NATO exercises off northern Europe and returned to the United States on 22 October 1957. In March 1958 after a three-month overhaul the destroyer moved into the Caribbean for refresher training. In May the exercises were interrupted. Roberts deployed hastily to Venezuela and prepared to evacuate United States nationals following the violence during Vice President Nixon's visit to South America. By the 15th however the situation was under control. Roberts was relieved and returned to Newport. Two months later she was ordered to Morehead City N.C. to rendezvous with amphibious units carrying Marine reinforcements to the Mediterranean during the Lebanon crisis. By 25 July the reinforcements were no longer needed. Roberts with her squadron Destroyer Squadron 10 escorted the amphibious units to Puerto Rico whence the destroyers continued on to the Mediterranean. Arriving on 10 August Roberts cruised off the coast of Lebanon from 17 to 25 August and again from 2 to 20 September to furnish gunfire support to the troops on the beach if it proved necessary. On 17 September she transited the Suez Canal thence proceeded to the Persian Gulf where she remained into October. On 19 October she re transited the canal. On 4 November she left Gibraltar behind and on 13 November she returned to the United States. Roberts operated continuously in the western Atlantic until 15 June 1959 when she sailed from Newport for the St. Lawrence River to participate in operation "Inland Seas " the opening of the St. Lawrence Seaway. After official ceremonies attended by Queen Elizabeth and President Eisenhower Roberts transited the seaway and crossed Lakes Ontario and Erie to arrive at Detroit Mich. on 3 July. On 20 July Roberts moved into Lake Michigan with the first destroyer division to traverse all five Great Lakes. On 27 July Roberts headed for the Atlantic again and arrived at Newport on 12 September. After further United States east coast activities Roberts joined the 6th Fleet in the Mediterranean on 31 March 1960 remaining until 29 May. She then passed through the Suez Canal to join the Middle East Force. She was relieved of Middle East duties on 30 June and rejoined the 6th Fleet in the Mediterranean. On 15 October Roberts returned to Newport. Spending most of 1961 undergoing a FRAM (fleet rehabilitation and modernization) overhaul in the Philadelphia Naval Shipyard Roberts returned to Newport on 26 February 1962 and remained in the western Atlantic for the rest of 1962 and most of 1963. During April and June of the latter year she operated off the northern New England coast in search of the missing submarine Thresher (SSN-593). In October 1963 Roberts resumed overseas operations; and for the next two years rotated between duty in the western Atlantic and tours with the 6th Fleet. In the fall of 1965 however she headed south transited the Panama Canal and moved into the western Pacific to join the 7th Fleet. She operated primarily in Vietnamese and Philippine waters until 19 February 1966 then steamed for home via the Suez Canal and the Mediterranean. Returning to Newport R.I. on 8 April she cruised in the Atlantic and Caribbean until deploying to the Mediterranean again on 8 December. Samuel B. Roberts returned to Newport on 20 March. She remained in Atlantic and Caribbean waters from that time to 10 January 1968 when she sailed on another tour of Mediterranean duty returning to Newport on 17 May. The remainder of the year was spent in Atlantic operations. She continued to operate in the Atlantic and Caribbean during 1969 until deploying to the 6th Fleet in the Mediterranean on 22 November. She steamed in the Black Sea from 9 to 12 December and returned to Newport on 22 May 1970. In August 1970 Samuel B. Roberts underwent Inspection and Survey the inspection team determined that she was unfit for further Naval service. Accordingly on 2 November she was decommissioned and her name was struck from the Navy list. She then joined the Inactive Fleet at Philadelphia Pa. where she remained until sunk as a target on 14 November 1971.